All sorts of cord, yarn and wire have been used with kumihimo braiding. Leather is another alternative if you haven't already tried it. 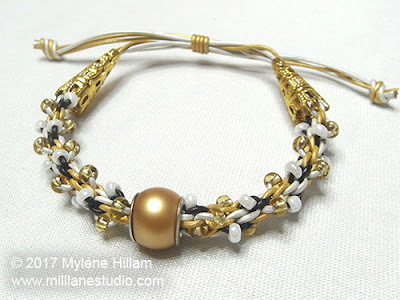 Mylene Hillam of Mill Lane Studio has an awesome bead and leather kumihimo bracelet tutorial. She uses conical bead caps and a large hole focal bead as design elements. However, what also stood out is the way she incorporated a sliding knot for a lovely finish. The tricky part is when the large focal bead has to be added and the leather cords have to be lifted from the kumihimo disc. Her tip is to remove 2 cords at a time to feed through the bead. Just in case, I think it also helps to take a quick picture of the disc before this step so if you remove too many cords and cannot remember where they all should go, it will help. I've never tried Kumihimo but I like the look of this bracelet. I like the cones and the sliding knot. I think that finishes the bracelet quite nicely. Beaded kumihimo is one of the main reasons I got interested in this technique in the first place :) I missed a couple of possibilities to attend some courses but am determined to do so before the end of the year. Thanks for featuring this project on your blog, Pearl!